Portrait of John F. Kennedy, a Norman Rockwell painting , appeared on the cover of The Saturday Evening Post published April 6, 1963. This is another timeless favorite of Rockwell collectors, a classic for all the ages. This painting was Rockwell's 321st overall out of 322 total paintings that were published on the cover of the Saturday Evening Post. Rockwell's career with the Post, spanning 47 years, began with his first cover illustration, Boy With Baby Carriage in 1916 and continued through his last, Portrait of John F. Kennedy, in 1963. This was also the third cover for The Post in 1963. In 1963, there were five Norman Rockwell Saturday Evening Post covers published. 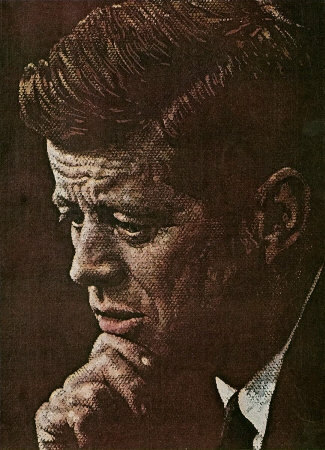 One of the covers, the final Rockwell image on the Post cover, was a reprint of the 1960 Portrait of John F. Kennedy, republished in memoriam. The original oil on canvas painting, 25 x 19 inches or 63.5 x 48.25 cm is part of a private collection. on page 238 of Norman Rockwell, A Definitive Catalogue by Laurie Norton Moffatt. One study is also reproduced in Norman Rockwell Catalogue on page 239. Norman Rockwell was priveleged to meet and sketch and paint President Kennedy several times over the course of his career. At their first meeting, the president impressed Rockwell with his youthful energy, as well as his friendliness. That was in 1960, just before Kennedy was elected President. This painting, however, was painted during a rougher time for Kennedy. His foreign policy, after showing success facing down Khrushchev over the missle bases in Cuba in the fall of 1962, had taken a decidedly marked turn for the worse in the winter. This painting shows Kennedy with seemingly the weight of the world on his shoulders and concern written on his face. Rockwell sympathized with the President, remarking that he wished there was something he could do to help "that young fellow." Rockwell also painted another Portrait of John F. Kennedy that appeared on the cover of the October 29, 1960 edition of The Saturday Evening Post. In addition, he also painted Kennedy in a tribute to the Peace Corps, entitled The Peace Corps (JFK's Bold Legacy) in 1966. Published in the June 14, 1966 issue of Look Magazine, that painting is now part of the collection of the Norman Rockwell Museum of Stockbridge, MA. That painting is also part of American Chronicles: The Art of Norman Rockwell. Portrait of John F. Kennedy was only one of 322 Norman Rockwell Saturday Evening Post covers; Here is the list of Norman Rockwell Saturday Evening Post cover illustrations. Rockwell also painted Kennedy at the 1960 Democratic convention in a painting called A Time For Greatness. That painting was published in the July 14, 1964 issue of Look magazine. Kennedy was not the only American President that Rockwell painted. He also painted portraits of Dwight Eisenhower and Richard Nixon and Lyndon Johnson. He also painted Egyptian President Gamal Abdel Nasser for the cover of the May 25, 1963 Saturday Evening Post and Indian Prime Minister Nehru for the January 19, 1963 edition of the Post. It was a great thing to be America's best loved illustrator. Do You Have A Great Story, Opinion Or Contribution About Portrait of John F. Kennedy?